If you have a Genealogical Data Communication (GEDCOM) file, you can upload it on your myFamilyTree page. Sign in to your myFTDNA account. Your myFTDNA page is displayed. On your myFTDNA page, click the myFamilyTree button. Your myFamilyTree page is displayed. On the lower-right corner of your myFamilyTree page, click the gear wheel. A pop-up menu is displayed. From the pop-up menu, click Upload a GEDCOM. The Uploading a GEDCOM will overwrite your current Family Tree warning is displayed. Click Upload to proceed with your upload, or click Cancel if you do not want to upload your GEDCOM. Browse to where your GEDCOM file is stored, select your file, and click Open to upload the file. After your upload is complete, a prompt is displayed. This prompt requests that you select or search for your name in the GEDCOM file. Select your name from the list, and click This is me! Note: Processing times vary and depend on the size of the GEDCOM file. Your processing time will vary, depending on the size of your GEDCOM file. How do I delete my GEDCOM? 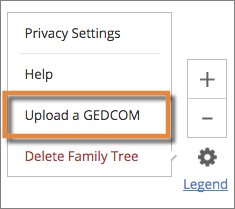 To delete your GEDCOM, log into your kit and click on the Family Tree icon on your homepage. Click the gearwheel icon at the bottom right corner of the Family Tree page. Click the Delete Family Tree option in red on the popup menu. Please note this will delete the GEDCOM and any updates you have made to your tree to date. A Genealogical Data Communication (GEDCOM) file is a special file format that was developed to provide a standard for encoding genealogical data. It is not used by most family tree software packages, but most can import and export to GEDCOM format. Because of this, it is today used by many genealogists to exchange pedigree data files. Where on my computer do I find the GEDCOM file? Where do I get a GEDCOM? To create a GEDCOM file you need to have genealogy software. There are many genealogy software packages available and free versions may be found for most computer systems. You enter your family history into the software, and you are then able to export it as a GEDCOM file. Where do I get GEDCOM software? Family Tree DNA does not endorse a specific genealogy package. You may wish to ask on genealogy message boards to see what other genetic genealogists are using. How do I export a GEDCOM file from my genealogy software? The procedure to export to GEDCOM format varies. The follow steps give general directions. Start your genealogy program, and open the family tree you want to export. Select SAVE AS or EXPORT (Which one depends on the program you are using.) from the menu. A new file window will display. Select the location on your computer where you want to save the file. In the SAVE AS TYPE menu, click the GEDCOM or GED selection. Enter the name of the file in the FILE NAME field. If an export confirmation window displays, click the OK button. The family tree is now saved on your computer as a GEDCOM file.